Built secretly, Tesla and SolarCity have revealed the first six Superchargers, which will allow the Model S and other electric cars that have the hardware fitted to drive long distances with ultra fast charging, 100% free through California, Nevada and Arizona. Eventually the whole of the USA, Asia, and Europe will have access to FREE ENERGY to drive 100% free, wherever they want to! Spend your dollars on research into free, clean energy, instead of buying poisonous drilling, mining, and shipping equipment and polluting the planet, paying ever rocketing prices for ancient fossilized sunshine just for electricity production. Great video. 2 minutes well spent. Not wasted. The tech built into the Supercharger was developed by Tesla, enabling Tesla to make the Superchargers for low cost. 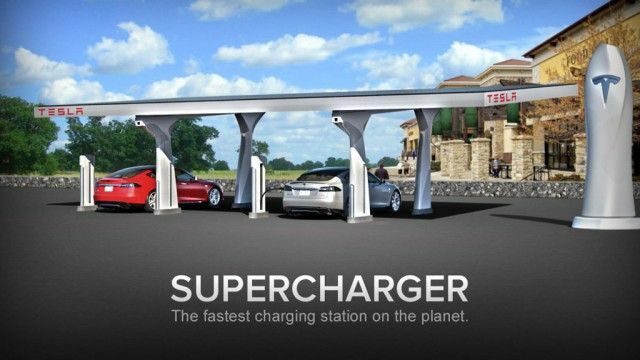 The Supercharger uses electricity from a solar carport provided by SolarCity, which makes it an extremely low or free energy cost after installation. Allowing you to drive free forever. Tesla is offering Model S owners and others who fit Tesla's hardware 100% FREE long distance driving forever. "The car will absolutely blow people's minds. I think that's the handling more than anything else," says Dayo Gomih at Tesla. The greatest advantage to owning or leasing an electric car is the capability to use FREE renewable power to charge the batteries in the car, and to put the excess into the grid for others to access, allowing you to drive free forever. "Tesla Motors is an automotive rarity — a startup, and a car company that comes out of Silicon Valley, not Detroit or Japan or Germany. Tesla hopes the technology it uses to make electric cars will upend the industry"
“Tesla’s Supercharger network is a game changer for electric vehicles, providing long distance travel that has a level of convenience equivalent to gasoline cars for all practical purposes"
"However, by making electric long distance travel at no cost, an impossibility for gasoline cars, Tesla is demonstrating just how fundamentally better electric transport can be” said Elon Musk, Tesla Motors co founder and CEO.